Released in time for the Olympics, Wild Games shows just that. This is a very unfunny and cheesy release, themed after and timed for the London Olympics of 2012. Unlike other Olympic themed slot machine games, this particular one features animals as athletes, making it all very cute and cuddly. We’re not quite sure about how most gamers are going to take it, but the response thus far hasn’t been the best. Cheesiness is evidently not something that a lot of gamers are looking for. The slot is played across 5 reels and has a total of 25 paylines for gamers to enjoy. For a slot that evidently such a simple release, that is quite a few paylines for players to mess with. The coin values range from £0.01 up to a tenner, and a total of 25 coins may be permitted to be wagered. This makes the maximum wager on this slot, a staggering £250, although players on a budget can get away with a wager of only £0.01 per spin, with only one payline, granted. Animals make up a decent proportion of the imagery used as icons in this slot. Cheetahs, Hippos and believe it not, bulldogs, make up some of the symbols, with other icons being represented by the high playing card icons, and different coloured Olympic medals. Yes, it is all very tacky, but evidently, that was the aim. There are plenty of superb bonus features in this slot, which makes what would be an otherwise dull release shine. The bonus icons are all represented by the aforementioned medals. Three or more of the same coloured medal triggers a bonus round, called the Win A Medal Bonus Round. Here, players are invited to pick from a selection of medals, with each one being worth a specific prize. Bronze medals could see a player bag anything from 2x to 40x their stake. Silver medals could be worth between 3x and 70x your stake. Finally, gold medals could be worth anything from 4x to 100x the stake. The more medals of the same colour you accumulate, the higher your multipliers will be. There is a wild icon in this slot game, and it is a stacked wild icon. There are three types of stacked wilds and these in turn can trigger 3 more bonus rounds. Depending on what stacked wild appears on the middle reel, you could enter either a cheetah, hippo or bulldog bonus round. Of course, if they aren’t on the middle reel, the stacked wilds will just result in substitutes and larger payouts. Of the three Stacked Wild Bonus Rounds, it is out of the player’s hands as to which one they get. Whatever the stacked middle reel is is what the player gets to play. The Freestyle Swim Bonus is triggered by having a bulldog stacked wild in the central reel. The player must choose one bulldog, and the player will receive either a gold, silver or bronze medal following a race. The medals carry with them a given number of free spins and multipliers, with up to 200 free spins possible to be retriggered during this round. The 100m Dash Bonus is triggered by a cheetah stacked wild in the centre reel, and involves another race, between three cheetahs. The prizes are similar to the Freestyle Swim Bonus. Lastly, there is a Balance Beam Bonus and again, there are free spins and multipliers to be won here. A set of judges votes the performance here with multipliers, so no medals are awarded in this bonus round. The most that can be won by playing Wild Games is a 3,000 coin jackpot. In order to win this non-progressive jackpot, a player will need to line up 5 of the Wild Games logos on any of the paylines. This is only purpose that the logo serves, for it is not the wild icon. Well the bonus games offered in this slot are very clearly thought out. The bonus rounds and special features are a lot of fun and add a certain level of respect and admiration, for what would otherwise be described as a pretty cheesy slot. 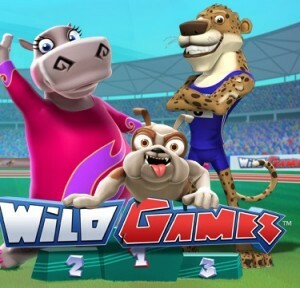 Wild Games hasn’t quite found the fame that Playtech might have hoped it would, and with the Olympics long gone, you might say that it will fail too. But for gamers running on a bit of a budget, who fancy something wholly different in terms of gameplay, and don’t mind playing a dozen or so bonus rounds in a day, this slot is good value for money and fairly rewarding. In short; you won’t love it, but you may win on it.